Because the majority of prescriptions (and some over-the-counter drugs) are mass-produced in specified dosage amounts, they are not necessarily customized to meet your specific needs. 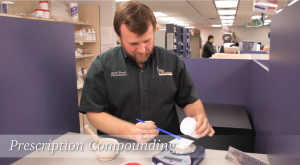 Compounding medications allow the physician to specify the exact dosage amounts as well as add or subtract ingredients you may or may not need. Compounds have been used for a wide range of therapy and (depending on the medication) and may be created in capsule, cream and lotion form. A benefit to a cream or lotion compound (or topical compound) is its ability to be applied directly to the affected area and is absorbed through the skin - avoiding stomach irritations to certain medications. Confused about your medications? We can re-package them to make taking medications easier and safer.